Fame, Liverpool, Oil, William Scoresby Jr., William Scoresby Sr. Previous to 1817 the town was wretchedly lighted by oil lamps which used to go out upon all trifling occasions and for insufficient reasons. They only pretended to show light at the best of times. The lamps were not lit in summer nor on moonlight nights. They were generally extinguished by four or five o’clock in the morning. The gentry were at one time attended by link-men or boys in their night excursions. These links were stiff, tarred ropes about the thickness of a man’s arm. They gave a flaring light with any quantity of bituminous-odoured smoke. In front of one or two of the old houses of Liverpool I have seen a remnant of the link days, in an extinguisher attached to the lamp iron. I think there is (or was) one in Mount Pleasant, near the house with the variegated pebble pavement in front (laid down, by the way, by a blind man). The link-extinguisher was a sort of narrow iron funnel of about six inches in diameter at the widest end. It was usually attached to a lamp-iron, and was used by thrusting the link up it, when the light was to be put out. 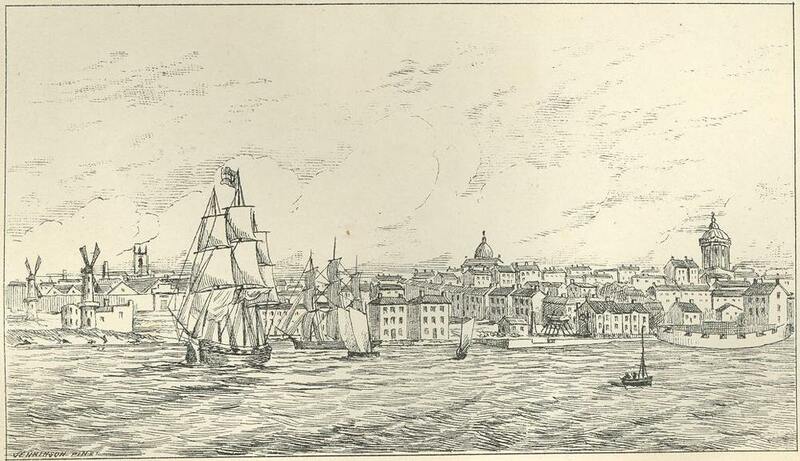 The image above is taken from Recollections of Old Liverpool and shows the city as it was in 1813.